Firefighters will run along with participants and meet them at the finish line to hand out finisher’s medals. 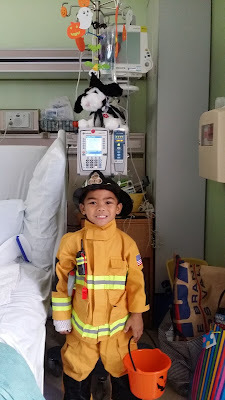 My son DJ, as aspiring firefighter, can't wait to run along the firefighters! Families, the community and race participants can also enjoy the interactive Fire Safety Expo. 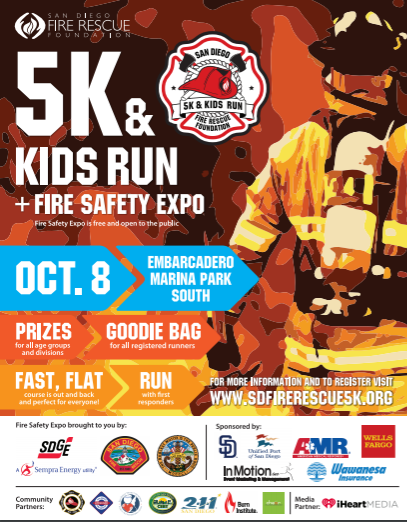 The Expo features firefighter demonstrations, SDFD specialty divisions including Bomb Squad, Hazmat and Heavy Rescue. Also present will be Sparky the Fire Dog, San Diego Project Heart Beat, CERT San Diego, San Diego Lifeguards, SDG&E Fire Safety House and more. The course starts and finishes just south of Seaport Village. Run, walk, or stroll past a beautiful marina and shopping complexes which includes 54 one of a kind shops, 13 casual dining eateries, 4 fine dining waterfront restaurants, and located in close proximity to local hotels. Very family-friendly, strollers welcome - including TWO kids run options!! Run with firefighters, lifeguards, medics, law enforcement and military! Special VIP gifts at check-in! Individuals, families, and kids are welcomed participants. Awards will be presented for first place male and female in each division! 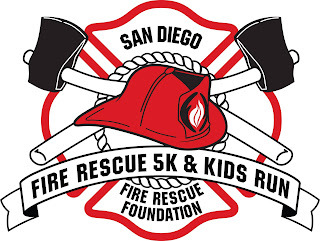 It'll be a great day supporting San Diego Fire Rescue Foundation! See you there!